Indesign, Adobe’s industry-leading page design and layout toolset lets you work across desktop and mobile devices to create, preflight, and publish everything from printed books and brochures to digital magazines, iPad apps, eBooks, and interactive online documents. InDesign CC is professional page layout software for print and digital publishing. Use it to design, preflight, and publish a broad range of content in print, online, and for tablet apps. You can create simple or complex layouts quickly and efficiently with precise control over typography, built-in creative tools, and an intuitive design environment. InDesign CC is built for designers, prepress and production professionals, and print service providers, and it’s available only in Creative Cloud. Browse and purchase premium hand-curated images and graphics from Adobe Stock — right inside InDesign. Create production-ready layouts using Comp CC on your iPhone, iPad, or iPad Pro, and then refine them using InDesign. The updated user interface offers a bigger, less cluttered workspace, with easy-to-read icons and fonts in panels, dialog boxes, and toolbars. Publish and distribute documents online for viewing on desktop and mobile browsers. Track their performance, share, and embed directly from the dashboard. Control assets in read-only Creative Cloud Libraries so they can be used by team members, but not changed or deleted. Send automatic updates to your shared libraries, so everyone’s always working with the latest version. Find the assets you need faster with a larger Libraries panel, new filtered search of Adobe Stock, and icons that make it easy to identify licensed Stock assets. See the length and format of each video in your libraries, and get links to video previews. 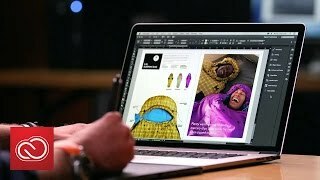 How does InDesign CC integrate with other Adobe products? InDesign CC tightly integrates with Adobe Photoshop CC, Illustrator CC, Acrobat XI Pro, InCopy CC, and Flash Professional CC. InDesign CC shares a common user interface, commands, panels, and tools with Photoshop, Illustrator, Flash Professional, and InCopy, so it’s easy to apply what you know about one program when you’re learning another, and to move efficiently from program to program. Because you can import native Photoshop and Illustrator files, it’s easier to lay out, enhance, and update graphics. The InDesign CC software development kit (SDK) provides documentation, tools, and sample code to help customize and build InDesign plug-ins. For more information, visit the InDesign Developer Center. Learn more about automating publishing tasks in InDesign with scripting resources. Adobe InDesign CC is available as a standalone application or as part of the Creative Cloud Collection on both monthly and annual plans plans.